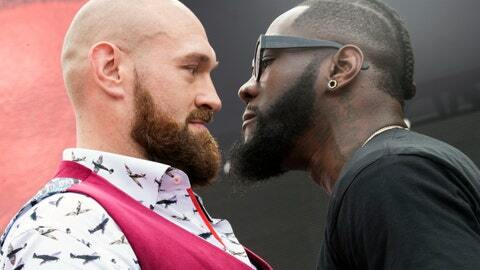 Just how well Deontay Wilder’s heavyweight title defense Saturday night against Tyson Fury in Los Angeles will do at the box office is a question mark. For all the power in his right hand, Wilder is still trying to build his brand and Fury is largely an enigma in the U.S.
What it means for boxing’s most prestigious division, though, is easy to quantify. The winner gets a glittering championship belt, of course, that signifies he is the baddest man on the planet — at least in the parts of the planet that currently recognize Wilder as the reigning heavyweight champion. And that’s still a big deal because even though the heavyweight division hasn’t been good in recent times, it’s brimming with talent right now. But the real prize will likely come sometime next year, assuming common sense prevails as it often doesn’t in boxing. That means a fight matching the Wilder-Fury winner with Anthony Joshua, the British puncher who currently holds the other parts of the title, in a pay-per-view fight that would do massive numbers. The best fighting the best, like the heavyweights of another era used to do all the time. And no better way to start it off then with an intriguing showdown at Staples Center between two undefeated fighters who both have their eye on a bigger prize. Wilder will be defending the WBC version of the title he holds against Fury in a fight no one was really talking about until it was made. That includes Wilder, who has campaigned hard for a unification fight with Joshua, even offering him a $50 million purse at one point to try to get it done. But Joshua has his own timetable, and with the fan base of an entire country behind him in England, he has the luxury of picking and choosing just who he fights and when. So, when he ignored Wilder, the American went looking elsewhere — and found a willing dance partner in Fury, who stakes a claim of his own to the heavyweight title after beating Wladimir Klitschko in 2015. Indeed, there should be no reason to talk much about Joshua this week. Wilder and Fury deserve to be center stage, if for nothing else than because both are willing to fight each other. There’s also a lot to like about the fight itself, even if most boxing fans decide to save their money for the holidays rather than lay out $74.95 for the pay-per-view. Wilder is a legitimate heavyweight champion, a 6-foot-7 former Olympic medalist who hasn’t lost in 40 fights and possesses freaky power in his right hand. He won’t win any points for a boxing style that can be charitably described as awkward, but he has knocked out all but one of his opponents — including Luis Ortiz, the powerful former Cuban he flattened his last time out in March. Fury, meanwhile, is even bigger at 6-foot-9, boxes like a middleweight, and has won all 27 of his fights. But he stepped away from the ring after beating Klitschko for the title and ballooned to nearly 400 pounds while binging on beer and cocaine. He said he was in a deep depression that has now lifted, but will be fighting for only the second time in his comeback. Oddsmakers make Wilder the 9-5 favorite, but there are legitimate questions about both men that still have to be answered. By the time they’re finished with 12 rounds or less the heavyweight picture should be in clearer focus and the winner should have a clear path to Joshua. This is boxing, of course, so anything can happen. But it would be hard for Joshua to keep claiming he’s the best if he doesn’t fight the best. In the meantime, boxing fans will have to be content seeing just two who might just be the best.